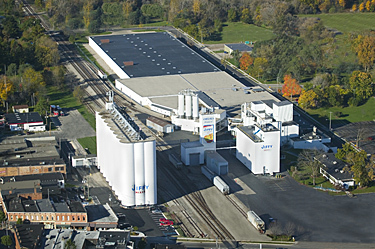 Looking for a prototype industry straddling a main line, try Chelsea Milling Company. 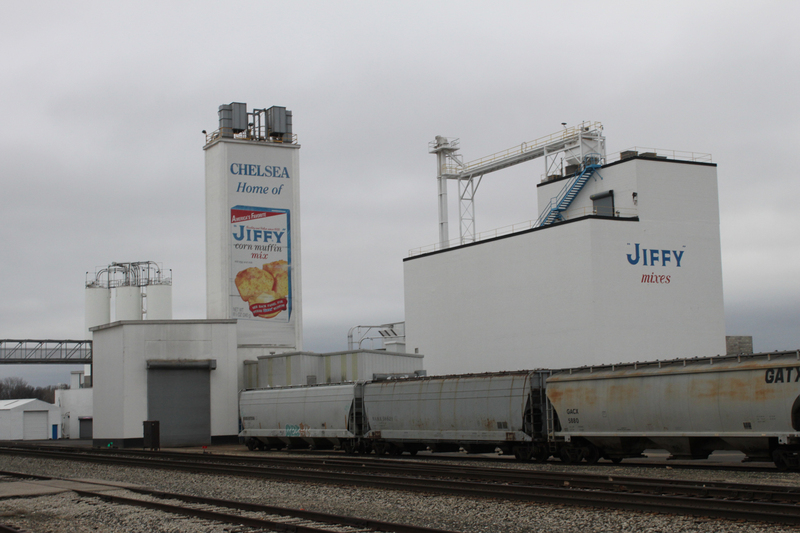 Located in Chelsea Michigan, the company produces Jiffy brand mixes since the 1930s. 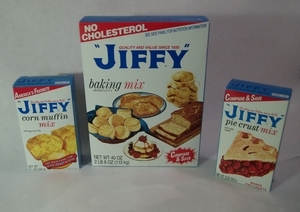 Jiffy was created as the first prepared baking mix in the United States. The company has been family owned and operated since it was founded. The company is now managed by Howdy Holmes, a former Indianapolis 500 and CART driver. The company employs about 300 workers and produces 1.6 million boxes of its products each day. The Jiffy corn muffin mix has a 90% market share and is the company’s biggest seller. Most of the company’s products are handled, processed and produced in-house, which includes grain storage, the grinding of grains into flour, product mixing and box manufacturing. A significant amount of product ingredients are sourced from Michigan-raised crops, including “most of the wheat and some of the sugar. Some sugar and shortening is imported from Illinois and Indiana. The company offers free tours of its operations to the public. Over the last few years, Chelsea Milling has been expanding into the food service and institutional industries. They have also been upgrading equipment and processes to become more efficient. To learn more about the history of the Chelsea Milling Company, and the “JIFFY” Mix brand, there is a Virtual Tour video. 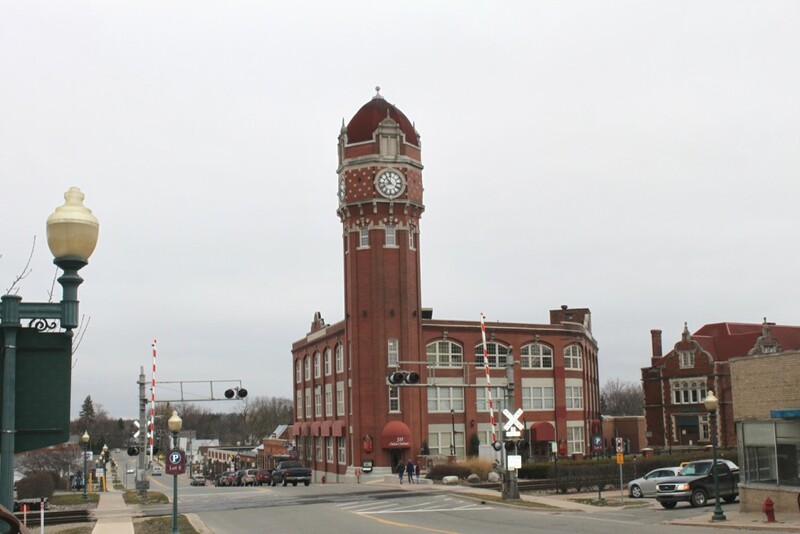 Chelsea was once home to the Glazier Stove Works who built a very large clock adjacent to the milling works and across the street from the passenger station. This clock tower is a major feature of Chelsea. If someone wanted to model the entire Chelsea milling works to scale, it is approximately 1,800 feet (20 feet in HO) wide along the main line. This includes the passing siding, all spurs and the switching lead. The depth of the scene could be done in 360 prototype feet (less than 2 feet) if the main plant is done as a background building with the grain elevators on the front of the layout. Most grain is gathered within a 150 mile radius of Chelsea and is delivered by truck. Even so there is almost always a few grain cars on hand and the plant can also receive other bulk products (such as sugar and Shortening) by rail when required. With selective compression the Chelsea Milling Company can serve a small layout, free-mo module or even be a small Layout itself. Excellent article and great modeling idea!